At first I didn’t mean to post this, because it was such a short dream, although packed with Grace and Light, but here I am, looking for something truly beautiful and inspirational to write about for the beginning of the New Year. And what could I ever find more inspiring than this dream? 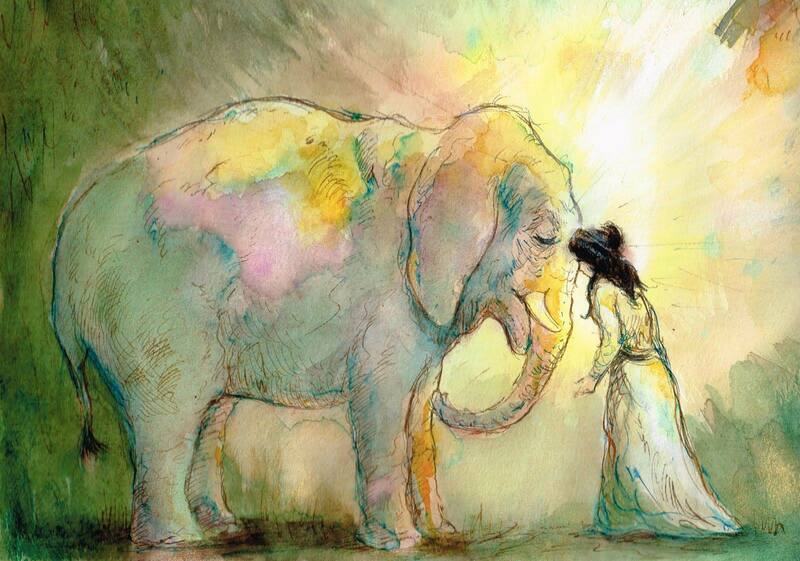 I can`t explain or describe the sense of bliss, of Grace, of Love, of infinite expansion that I felt in that moment of union with this beautiful creature, but maybe Andy Boerger’s extraordinary painting can give you a better idea. Since there are not many reflections or considerations I can make about this, except that it was such a wondrous experience that stayed with me to this day, let me try to just tell you briefly about it. It was April 21 , 2005. I woke up in the middle of the night and found myself wondering about something pretty enigmatic that I had read the day before, that dolphins are like pilots and whales are a sort of libraries, a kind of database of ancient knowledge, and that some big animals roaming the Earth have the same task or role too. “It must be elephants”, I thought. Then I dropped into sleep and a most wondrous dream came. I see an elephant, not particularly big, coming out of a jungle . He (I seemed to have assumed it was a male) comes towards me and I approach him. As I get close, like very close, I put my forehead on his forehead above the trunk. And lo and behold ! as our foreheads touch, all LIGHT explodes! There was a burst of Light that I shall never forget. And it `FELT` LIGHT !!! And with it a myriad of wonderful sensations exploded inside me. A sort of expansion and light coming out of us and enfolding us. “The meaning of deserving is human made; the meaning of reward is earth-bound. When you get there, you will have transcended the concept of reward; you will be beyond the concept of merit. You will feel the perfection and the ease and the peace. Love is the ultimate perfection of you. In my life I have had the joy of experiencing vividly beautiful dreams, uncanny out of body experiences, and truly insightful hypnagogic visions, but the lucid dream experience had always eluded me … that is, until now. The other night I was blessed with a taste of such incredible human experience, and although it lasted for only a few minutes, I am still so happy and mystified that it happened at all. This infinitesimal moment of lucidity proved to become the catalyst for one of the most astounding spectacles I have ever witnessed and it bestowed such gift I shall be forever grateful for. So, here is my wonderful one-moment-lucidity dream story or actually dream vision from my Dream Journal!! Just as I said this, the image changed completely. I am now looking at the blue ocean from somewhere above. And in front of my eyes there is an incredible seascape. On the left I see the shoreline with a beautiful sandy beach, and on the right is the blue ocean. Now on the left area of the ocean I see a beeline of whales basically `standing` with their bodies half out of water and spraying water up in the air from their mouths. There must have been 30, 40 of them, more maybe. They were all standing in this position half body out, and spraying water upward at the same time. A kind of synchronized swimming in order to make this exquisite dance of water sprays. So from up in the sky where I am, I see on the left side of the ocean this row of standing whales spraying water upwards, and on the right this row of whales jumping one after the other out of the water alternately on the right and left. It is an out-of-the -world view to behold ! all this beautiful water show of sprays ! and all these beautiful creatures ! Then as I zoom up on the `standing` row of whales on the left, I can see their faces from closer and realize that the first 20 or so were whales indeed, but the second half were dolphins, although they were almost as big as the whales . Can you imagine this picture ?? This magnificent extravaganza of whales swimming, jumping, splashing, all the time making huge sprays of water, either from up their mouths or by jumping/falling onto the water, and on two different rows and going on for miles !!! a sort of synchronized water-dance show displayed for my benefit, and it seems at my request !!! I couldn’t believe my eyes. To say that my dream-jaw dropped is an understatement!!! I came back to normal consciousness too soon indeed, but woke up in pure euphoria and gratitude for this incredible spectacle and performance they put up for me. After all, I had requested `something beautiful `, right??!!! And they gave me more than I could have imagined or ever hoped for!!! Too bad that it lasted only for a few moments and that even after this inspiring experience I can`t yet say I have had a full-scale lucid dream – at least to this day. Nonetheless, we get what we get, and let`s be happy and grateful for what we receive, and graceful about it 🙂 ! OK, this is a little different from my usual posts, but I thought I would like to share with you the introduction to my little book “FOAL and the Angels”. Without going into too many details, I do explain how it came to be. I consider and have always considered myself to be a very well-balanced, totally grounded person, leading a very normal life. I was born in a Western European country and stud­ied several languages in order to become a simultaneous interpreter. My father was a doctor, and despite the fact that he was the best person in the whole world, he never talked of God or spiritual things. In my family I was the only one who went to church, maybe because I always felt this profound love for God inside. Nevertheless, I was always sitting alone in a dark corner of a small chapel inside the church, rather than taking an active part in the service. But then, when I was 21, a very special thing hap­pened. I was invited to a Tibetan meditation by a friend, and I remember being very nervous about it. It was a first for me. I had never meditated before in my life, but I was interested in Oriental cultures, and so I joined the medi­tation. The most vivid memory I have of this event is that as the Lama was approaching each of us with some sacred objects in his hand, all I could think of was that he would immediately know that my mind was all over the place and was doing anything but meditating. So when it was my turn, I was really ashamed of my unmanageable thoughts and got mentally ready for a scolding. What happened next defies logic or any rational explanation. As the Lama touched my forehead with some kind of relic, the world disappeared. I had this great sense of Light, like successive waves of Light coming out, rising out of me, out of my belly, and reaching out and out and out. It happened. Like that. Unexpected, not even asked for, since I had no idea what to expect or ask for. After this I found I was changed; so poised, so bal­anced, so perfect. And I just could not get angry. Try as I might, even in provoking situations that would have usu­ally strongly irritated me, anger was nowhere to be found, it just could not rise. I clearly remember myself thinking “Oh, my God! I will never be able to get angry again!” 🙂 I was in blissful synch for a few weeks. Then it faded away, but it left a deep mark within me. To this day, I still don’t know why it happened so spontaneously. The moment of short but intense momentary enlight­enment in Foal’s story gives a detailed picture of how it felt to me. It left me stunned and dazed, forced to believe the unbelievable. While I received all the messages and dreams described here between 2004 and 2010, this experience actually goes back to 1975. And this is actually one of the very few liberties I took. Then, just a bare month after this incredible thing happened, I met my Asian husband-to-be; I quickly and overwhelmingly fell in love, got married, and settled down in a foreign country. Adjusting to an Asian culture so totally different from mine absorbed the whole of me and took all my energy and time. I was preoccupied with being a good partner to my husband, raising kids, and working, all while learning a completely new language, culture, and cuisine, so that for almost 30 years, spiritual matters were left at the back of my mind, simmering there, relegated to a tiny corner in my brain. Before going on with my story, let me stress this. I was so not a New Age person. I can’t stress this enough. New Age was just not my thing. I had actually never even heard of the term New Age until, about 10 years ago, I found it in a book I was reading, but it was used in such unflattering tones that, from the very start, I was totally biased against it. Well, as it goes, one Christmas, just before I turned 50, one of my daughters presented me with a New Age book, On Wings of Light, channeled by Ronna Hermann. I still remember so clearly that the only reason I started reading it was that I was worried that my daughter might have gotten into a cult, and I wanted to check it out. Well, talk about spirituality! In fact, this wonderful book proved to be a true revelation to me and changed my life in more ways than I could have imagined. More than the words themselves, it is what happened while I was read­ing through it that was a true “wake-up call” for me. As I was reading a certain passage, the words, “I am Archangel Michael,” clearly stood out, totally overwhelming me. I don’t know how to explain this, but while my eyes fell on those words, it felt as if a huge presence had just landed in front of me and physically struck me on the chest so strongly that I felt like falling back a few feet. And in my mind I heard a voice saying Hey! It is Me! Wake up! Don’t you remember? I was shaken to the core. This was so incredibly real to me that I struggled for a rational explanation for sev­eral days. To me, this was not one of those things that I could share easily, at least not in my world, so I kept it close inside. And as I struggled to come to terms with it, the stunning dreams started and the out-of-body experi­ences, too. What’s more, there was this feeling I could not shrug off of Essences all around me trying to com­municate something to me. As I realized that all these incidents must be connected somehow, I came to see that moment with Archangel Michael as a true Clarion call. All this happened almost at the same time, raising a thousand questions inside me and a desire to know more, to understand more. I naturally fell into this pattern of daily prayer and nightly meditation that started me on this journey of self-discovery. I received all the messages (and there are so many more, actually) in this book dur­ing meditation or just before falling asleep at night. The words would flow so fast in my mind, that often, to keep up with that pace, I had to skip a word or two, if not part of the sentence itself. What I describe here is almost exactly how it hap­pened, or at least, how it was felt and registered by my mind and in my mind. The main liberties I took were to squeeze the six-year span into a story that lasted just a few weeks and to leave out some repetitions. As for the dreams, I have reported them all exactly as they were. I have tried to keep as close to reality, to my reality, as I can. So, is all this true? I don’t know. How could anyone possibly know? But genuine? Yes. It totally comes from the heart. The fine line between my imagination and inspiration was unknowingly blurred into one of a bigger Truth, becoming a sort of thick pipeline between two dif­ferent worlds. I experienced this from the inside out, liv­ing the fascinating and captivating dreams, being amazed at the beauty and wisdom of the messages. Nothing could be truer to me than this experience; nothing could be more real to me. It was an intensive course of wisdom,imparted through dreams, messages, and voices. I called it Angels’ School. It took me a long time to get over my ever-present self-questioning doubts. And now, at last, I have finally set it down into words—words that feel so inadequate, wanting, and imperfect to describe such an experience. 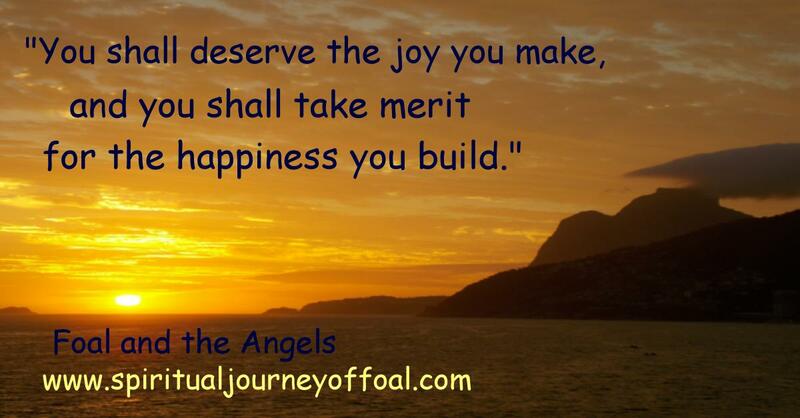 But if the angels’ messages and Foal’s experiences can help people understand their lives better, I will find value in it, and it will all be so worth my efforts. And I wanted so much to share it anyway; it is just too beautiful to keep it all to myself. Besides, I was asked to write this down. And God does not take no for an answer. My greatest hope is that this may be read and cherished not only by already spiritually connected persons, but also by the “layman,” and that this may be the beginning of an awakening for them too, as it was for me. This is a fairytale, a true fairytale. 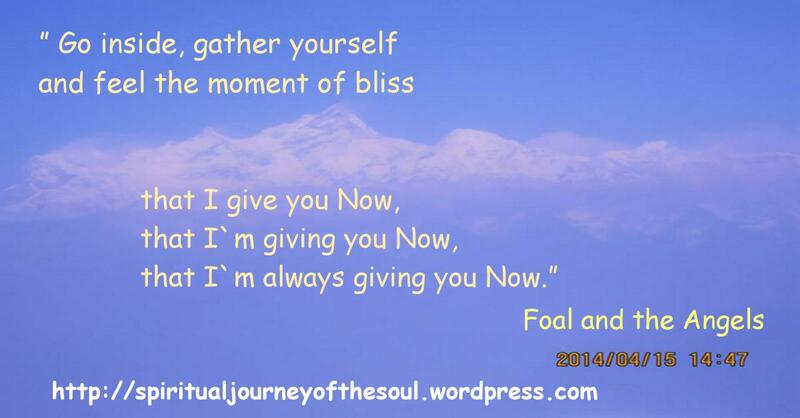 It is about Foal and the angels. 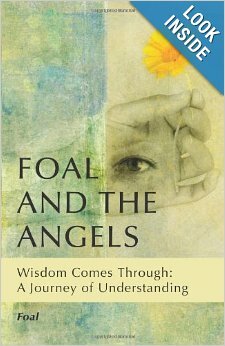 “FOAL and the Angels” is a new book with a fascinating background for devotees of spirituality and self growth. Over the course of five years the author, received a series of insightful messages through his dreams. Inspired to share the messages and discoveries of his journeys in astral projection, the author weaves the teachings through a semi-fictional narrative. Though the events are real, the book condenses the events to an easy to read story. This book is suitable for any age and makes for profound, yet easy reading. The story is about spiritual awakening and forms what the author calls “Angels’ School.” It is the story of a boy who asks a thousand questions of God and the Angels. He receives his answers through dreams and insightful messages. Despite the highly spiritual slant to the journey described within this 128 page book, it’s not necessary to be a spiritual person to gain some mental clarity on life and how to live a successful life in accord with your own nature. Nick : I would like to begin by asking where the ideas behind FOAL and the Angels came from? What was your main inspiration? FOAL : Well, you start with the most controversial question for me! Truth be told, the story of this book was given to me practically during my sleep and during meditation. And sometimes it was even whispered in my ears by invisible friends… not joking here! If you asked me about some particular sentences that I remember well, I could even tell you which ear it was, left or right! So I am afraid I don’t really have a main inspiration. All these incredible `teaching` dreams were the inspiration in themselves, and a gift at the same time. Yes, a gift! From whom, you ask? Well, THAT is the question, right? But does it really matter if they were Angels or God or a Collective Consciousness or simply my subconscious? They are beautiful and so wise and they hold a huge and profound lesson of growth and potential for everyone. At least so I hope. Honestly, I don’t know if I have a `specific` style, I have never even thought about it. I just write the only way I know! Yes. And I am very passionate about this. At night, but not only at night, we do have a chance at communicating with other layers of dimensions and of course with the inhabitants of those dimensions. If we are willing to give it a real try and keep an open heart, this is an avenue open to practically anybody because everybody dreams, right? Of course, this is not something I can prove to you rationally, but if you asked any real dreamer or OBE (out of body experience) traveller, they will all tell you the same thing. Now, since I am really no scientist, I can speak only from some very personal experiences, but I know that with the quantum theory we are closing up the gap between science and spirituality, and am pretty sure that in a very near future, many of the so-called spiritual theories will be well vindicated by science itself. Well, I love the Bronte sisters and Daphne Du Maurier in particular, especially if we talk of writing styles. In this very moment of my life, I would choose Robert Moss, as I feel very close to his way of looking at dreams, astral travels, other dimensions and besides, I really love the way he writes. Pure poetry in prose. I am skimming a few of Swedenborg`s books right now, and just started perusing the Upanishads. But don’t worry! I also read lighter stuff like Harry Potter, Twilight, etc! Entity? Do you mean a person or invisible entity? Before the publishing of FOAL and the Angels, a few friends were very supportive indeed with all the reading/editing stuff, but more recently, Anthropology Professor Marco Pardi and inspirational author Denise Barry showed me the greatest support in helping spread the word. However, if you`re asking about invisible entities… well, as far as I am concerned, there were very many! I didn’t start writing to make a career. 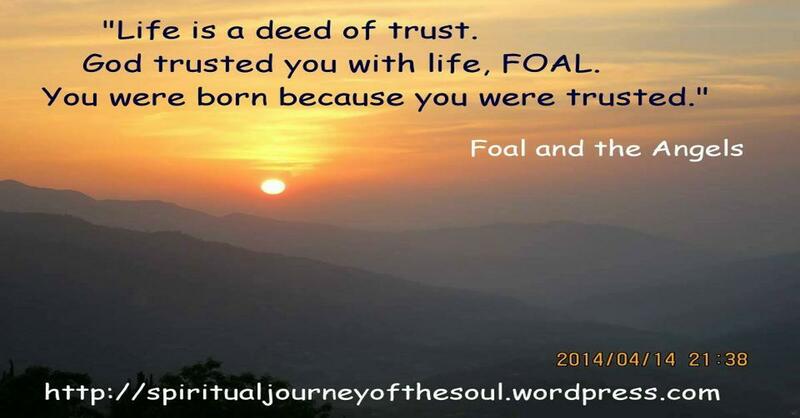 Writing is something I enjoy doing, and in FOAL and the Angels’ particular case it really felt as if it was requested I shared my experience with others. No, I couldn’t change anything. In fact, I put a lot of effort in trying not to change anything at all, and focused on reporting exactly the dreams and voices as the experiences they were for me. I have been writing poems since I was ten, so I guess that is when it originally started. I really like my book cover. It was designed by professional designers at Turning Stone Press. They sent me a few to choose from, but this one was just too perfect to be true! To find the right ‘personal/impersonal’ thread to stitch all the dreams and messages together into the format of a fairytale, without making it too private. ‘Learn anything’ is definitely an understatement. I learned so much I could hardly put everything in any book. But to sum it up, I daresay that it taught me how to live in a more conscious way; it taught me that every little action counts, every thought we have is of the utmost importance, every insignificant word makes a difference, and we must not let these moments pass us by unconsciously. We are here to live every moment. Don’t ever let yourself believe you are alone in this world. Actually, there is quite a crowd indeed of, so to speak, ‘imaginary’ friends around us all the time! Again allow me to share a page from my little book “FOAL and the Angels” to talk about something that is very close to my heart …the seemingly unfairness of life. Mmm, that`s a heavy topic, and I guess most of us can relate. Why is it that some people seem to sail through life as easily as a breeze, while others have to toil about and struggle to simply breathe some air ? I don’t presume to have all the answers, because I have not, but I know that dreams have helped me deal with this in an unambiguous and uncanny way. And as it goes, a few nights later I got this `clarification` dream, a huge, HUGE `Teaching Dream`. It always baffles me how dreams are able to impart teachings in such way that they seep down under our skin in such unassuming and yet uncannily profound way. How do `they` do it ? how do we do it ? Is it our brain, our subconscious, our Higher Self, is it God or the Angels, or is it our mind … but yet, what exactly IS our mind ?? Well, again and most unfortunately, I don’t know. But I know that when I get a dream like this, I feel like I KNOW (true capital letters). I feel like I don’t have the answers, and yet I KNOW. I KNOW somewhere else than my mind, I KNOW in a place inside me that I haven`t found yet, a place still mysterious and inaccessible yet to me. My mission in life is to find this place of KNOWLEDGE, the place or part of me that KNOWS. So, why do we suffer in such way? I asked. Wow, that gave me pause. I think my heart skipped a beat. This statement alone had the power to stop my thinking process for a few moments. We know Truth when we hear it. And yet … can we live without comparing ? Can we ? If we didn’t know the others` lot, would we be more accepting of our own lot ? If we could stop comparing what `others` have or what we had `before`, could we finally concentrate on the joys hidden in this very moment of Life? and butterflies or bees visiting her petal brows ….. 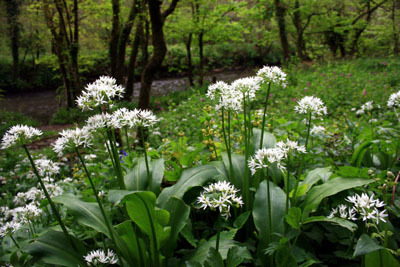 Does a plant have its own world of dreams ……. “From above, Foal could see the sea and a large sandy beach. A race was going on. 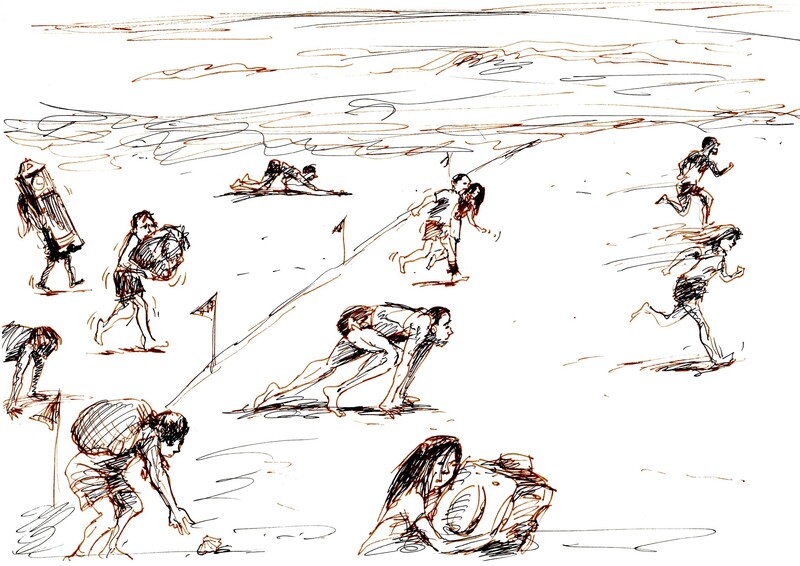 People were all racing on the sand toward the same goal, but in an odd way. They were not starting all together, and in addition to that, each of them had to do some different steps and chores on the way to the goal. Some of them had to pick up something with their mouth; others held a huge heavy package with both hands on their belly, while still others had their hands free and no burden at all. A few were holding strangely shaped objects and doing strange things that Foal didn’t fully understand. Some others seemed to be bound together at the leg so they had to run in pairs, and some had to pick up something from the ground on the way to the finish line. But then some guys were running unencumbered and didn’t have to play any strange games. Foal was baffled. It looked so unfair. The most amazing thing to him was that they were not even all starting at the same time. On top of that, a few looked like they started several yards ahead, and others began a few yards behind the starting line. Foal couldn’t understand the rules of this race. What kind of game was this? Was nobody there setting any decent rules? Foal woke up bewildered an utterly incredulous. He knew what he had seen and understood what he had been shown, but he just could not accept it. It represented a concept staggering to his mind and he felt himself rebelling against it. Now, back to our reflections … So, if we can’t have all the cake, the trick may lie in endeavoring to make our own little cake along the way, step by step, or baby-step by baby-step. Some people have more, some people have less, or that`s how we see it. But we all have our own gifts for sure. We must accept we are not all given the same things. However, they can be improved on. And THAT is the true beauty of it, that is what makes so precious whatever it is that we are given and why we should not belittle what we have. Thinking about it doesn’t seem so difficult after all, and yet …. why does it prove to be such a huge trial ? “Foal, this is the Angel of Now. I am a feminine energy, because I talk of Home. To be in the Now is to be HOME. Do you not see… when your thoughts wander, when you are distracted, when your worries take you to a future that still does not exist in your life, there is nobody HOME. When your guilt or regrets or nostalgias take you to a past that has ceased to exist in your life, there is nobody HOME. Your body feels like a shell – nobody HOME. BE HOME. Be in there, be in that moment, be in your body. Inhabit your Soul-place, inhabit your Soul-body. 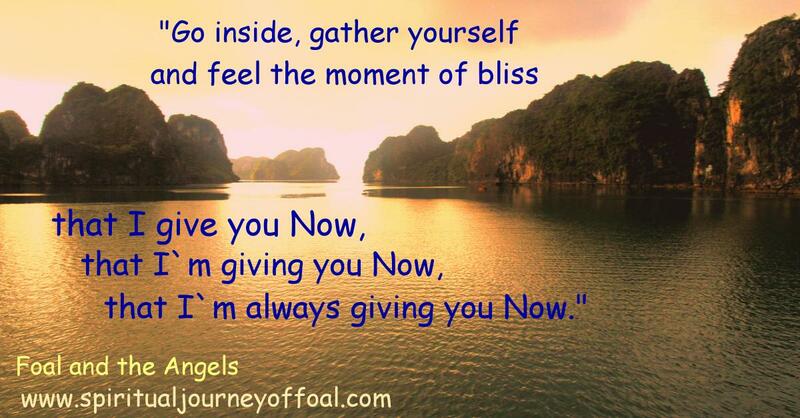 Be there in each Now. That is the meaning of Now. To be HOME is the moment of Now. Be present in your body, fully inhabit your vessel. Inhabit your cells. When I knock on your door, I expect you to be HOME. Welcome guests arrive when you’re HOME. Waiting on them is your greatest pleasure. They come from afar; they wish to find you HOME. You are “Who-you-Are” when you are HOME. HOME is the center of the Universe, center of you that is God. When I first received these words, I was totally overwhelmed by the sheer power of the statement. Just a few syllables, but enough to turn my world upside down. You see, as it happens, I was raised in a catholic culture and for many years went to catholic school, where it was obligatory to take religion classes. If memory serves me, in all those classes, I was always being taught I had to trust in God, to trust He knows better, to trust He knows all, to trust He will take care of me, and so on. Not once had I heard that God trusted me, not only that, but that He trusted me with LIFE !!! This statement was to me as mind-blowing as eye-opening, mm, more than that, make it heart-opening. It opened my heart, completely and irrationally, it opened the way to the knowledge that comes through the heart. As it is, rationally, I couldn’t quite follow, but deep inside me these profound sounds resonated like a booming truth, like nothing else had before. All those many hours of religion classes wiped away in one clean stroke ! …………….. Second wave of blissful astonishment washing over me … I was born because I had been trusted …. ??? WOW!! My mind felt like splitting open like the Red Sea in an effort to absorb this new kind of knowledge in all its profundity. I needed to spend some time alone with these words, some quiet time alone with these words. I closed the door of my room and meditated. I needed some time to digest all this, I felt the need to make it mine, to pull its essence /teaching/truth into every fiber and cell of my body. And to see where it was taking me. And then, for the first time, I really kind of saw it. Just as God had trusted me with life, He was also trusting me now with the writing of this little book, `His` little book. All He was gently imparting to me in dreams and waking meditations could not be meant for me only; I could not be given all this and not share it. He was telling me this was part of the LIFE He had trusted me with. How could I let His trust down? I think this is the very moment when FOAL and the Angels was conceived, as a book , I mean, and not as a bundle of uncoordinated pages of messages and dreams .